Background : A full-thickness soft tissue defect closure often needs complex procedures. The use of dermal templates can be helpful in improving the outcome. Objective : The objective was to evaluate a sandwich technique combining the dermal collagen-elastin matrix with skin grafts in a one-stage procedure. Materials and Methods : Twenty-three patients with 27 wounds were enrolled in this prospective single-centre observational study. The mean age was 74.8 ± 17.2 years. Included were full-thickness defects with exposed bone, cartilage and/ or tendons. The dermal collagen-elastin matrix was applied onto the wound bed accomplished by skin transplants, i.e. 'sandwich' transplantation. In six wounds, the transplants were treated with intermittent negative pressure therapy. Results : The size of defects was ≤875 cm 2 . The use of the dermal template resulted in a complete and stable granulation in 100% of wounds. Seventeen defects showed a complete closure and 19 achieved a complete granulation with an incomplete closure. There was a marked pain relief. No adverse events were noted due to the dermal template usage. Conclusions : Sandwich transplantation with the collagen-elastin matrix is a useful tool when dealing with full-thickness soft tissue defects with exposed bone, cartilage or tendons. We present herein a series of patients treated with the collagen-elastin matrix and split-skin mesh graft transplantation in a one-stage procedure. Twenty-three patients (15 males and 8 females) with 27 wounds were enrolled in this prospective single-centre observational study (including 5 patients previously reported). The age range was 21-89 years, with a mean of 74.8 ± 17.2 years. The wounds were either acute (after surgery) or chronic (like leg ulcers). All wounds were characterized by exposed bone, cartilage and/or tendons. In the majority of patients, previous transplants (sometimes multiple) had failed. Wound healing could not be improved by non-surgical methods. Patients with acute wounds were those who underwent delayed Mohs surgery for facial or scalp non-melanoma skin cancer (NMSC) and defects where standard surgical procedures like flaps or grafts were impossible due to morbidity, surgical reasons or due to patient's wishes (n = 9). The tumour diagnosis was basal cell carcinoma (BCC) in four and squamous cell carcinoma (SCC) in two patients. All facial tumours were localized on the nose, with two NMSC cases of the scalp. One patient suffered from calcifying prepatellar bursitis and another patient presented with a longstanding burn scar of the lower leg suggestive of malignant transformation. Fortunately, the malignancy was not confirmed by histopathology in this case. Fourteen patients suffered from 16 chronic wounds of the lower extremities. The aetiology of the wounds was venous (3), mixed arterio-venous (7), post-necrotizing fasciitis (1), post-surgical (2), pressure sores due to paraplegia (2) and pyoderma gangrenosum (1). In all of these wounds, tendon and/or bone was exposed not allowing simple split-skin mesh graft transplantation. The location of wounds was either the foot (n = 6) or the lower leg (n = 10). The size of the wounds was between 4 and 875 cm 2 . Before sandwich transplantation, all other measures to improve perfusion had been tried to the bottom of the matter. In five ulcers, wound bed preparation was supported by negative pressure treatment (VAC TM ; KCI Licensing, Inc., San Antonio, TX, USA) before to shorten the time to surgery. The dermal collagen-elastin matrix (Matriderm TM ; Dr. Suwelack Skin and Healthcare Ltd., Billerbeck, Germany) was used in sheets of 74 × 52 × 1 mm. Matriderm TM was cut to size and regenerated using Ringer's solution for a couple of minutes until the sheets became translucent. The template was applied directly onto the clean wound bed. Full-thickness skin transplants were used for facial defects. For all other types of wounds, split-skin mesh grafts were obtained. The grafts were placed above the dermal template (therefore the term 'sandwich' transplantation has been coined). The transplants were fixed with non-absorbable sutures (face) or staples (all other regions). As a dressing, silicone sheets (Mepitel TM ; Mölnlycke Health Care, Gothenburg, Sweden) and cotton swaps or compresses were applied. In addition, compression bandages were used for leg ulcers. The first dressing was allowed to stay for 6 days. Regular dressing changes followed. In six wounds, the transplants were covered by silicone sheets, microporous foam (GranuFoam™) and treated with intermittent negative pressure (-125 mmHg) using the VAC TM therapy system for 7 days. We used this technique in cases were due to anatomical and pathophysiological reasons, transplant survival was critical. Perioperative antibiosis was chosen in all facial wounds and in patients with previous severe infections (like necrotizing fasciitis) or immunocompromising disorders like serious diabetes mellitus. The usual duration of antibiosis was 7 days. The drugs were chosen according an antibiogram for leg ulcers. For facial defects, cefuroxim 500 mg was given twice daily. The size of soft tissue defects was between 3 and 875 cm 2 . All patients had one or more comorbidities including diabetes, chronic ischaemic heart disease, hypertension, ankylosis, paresis and depression treated by appropriate drug therapy. The use of the dermal template resulted in a complete and stable granulation in 100% of wounds. In the case of complete graft take, wounds healed within 9-14 days [Figure 1] and [Figure 2]. Three of four facial defects healed completely. 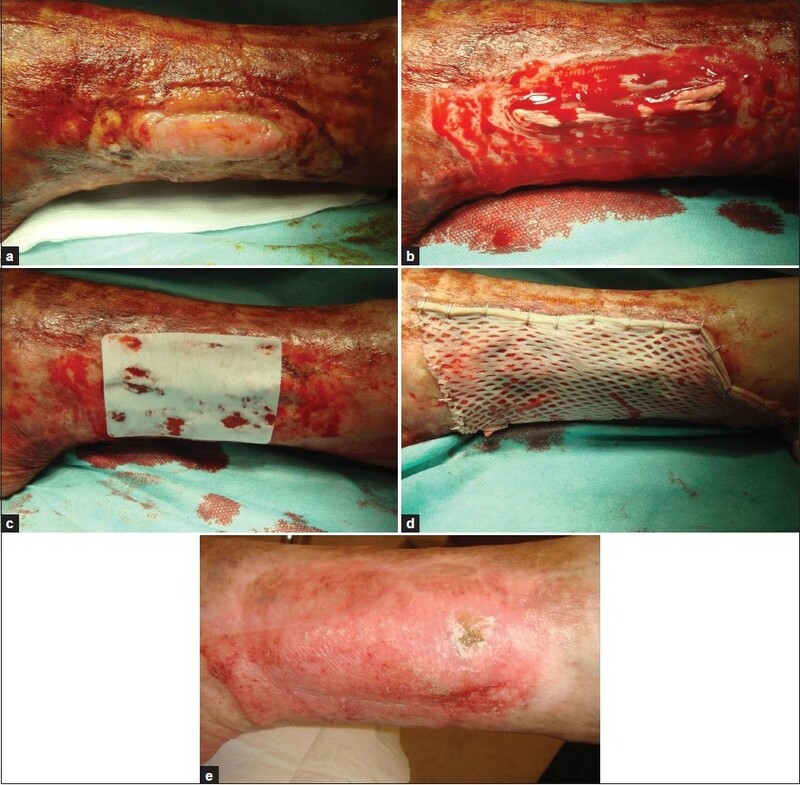 The follow-up for 6-20 months demonstrated not only stability of the wound closure but also a very good aesthetic outcome [Figure 3] and [Figure 4]. Of the two scalp lesions, one healed completely while the other one - a very large wound (375 cm 2 ) - showed only a partial graft take after 2 weeks. From all soft tissue defects and chronic wounds treated, 17 showed a complete closure (complete remission, CR) and 19 achieved a complete granulation with an incomplete closure (partial remission, PR; [Table 1]). Of 10 patients with a visual analogue pain score of >6, all reported a marked pain relief, but 5 became pain free. The effect on pain was not restricted to a CR of the soft tissue defects/chronic wounds. One patient developed a secondary infection 2 weeks after surgery resulting in a loss of the transplant. The final outcome, however, was a complete wound closure after 8 weeks of conventional good ulcer care. The final outcome of the other three patients with incomplete graft take was a complete closure after 8 weeks of conservative treatment (n = 2) and reduction of the wound area by 80% after 8 weeks of good ulcer care (n = 1). The transplants were stable even above the exposed Achilles tendon. The transplants did not show any significant shrinkage during follow-up. 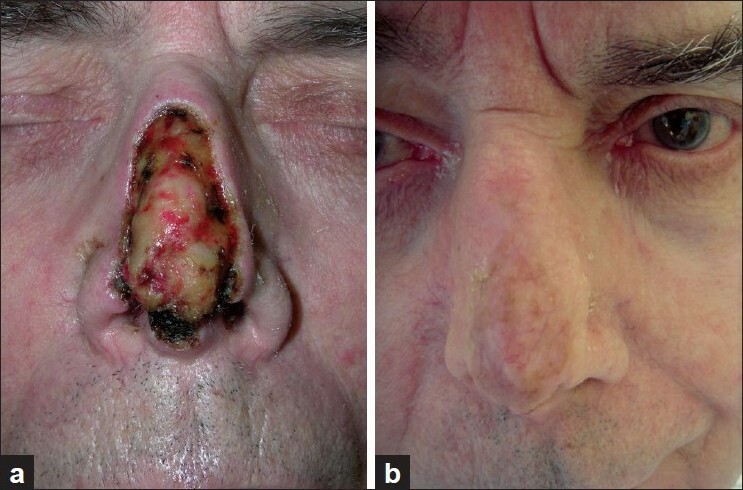 In a single patient with a surgical wound on the tip of the nose, the transplant failed, but granulation was good and the wound area decreased about 50% in 3 weeks. Because there was a partial sorption of the soft tissue resulting in a 2-mm defect, second surgery with a primary wound closure by sutures was performed 4 weeks later. No necrosis of the underlying tissue was noted in the case of transplant failure. The aesthetic outcome was very good or good in 17 patients. No adverse events were noted due to the dermal template usage like biocompatibility problems or granuloma formation. The volume of the template and, in particular, the thickness, does not seem to diminish during the healing process. Skin elasticity was clinically not different from the surrounding tissue. The operation time was not prolonged by the use of the 'sandwich' technique. The technique can be easily used in conjunction with intermittent negative pressure when necessary. In soft tissue defects, a wound closure often is possible by transplants or flaps. In other cases, the use of dermal templates has become an alternative. Nasal tip defects are challenging. In a comparative study, Riml et al. observed better outcome with a perichondrodermal composite graft and reported two patients developing fistulae after Matriderm TM -aided skin transplantation. We observed a complete graft take in three of four patients, but further studies are necessary. Another important effect of the elastin-collagen matrix is pain relief. Pain is a major factor in chronic wounds that has a substantial negative impact on quality of life. We suppose that the pain relief is supported by wound dressing-like qualities of the dermal matrix and improved granulation, but further studies would be necessary to better explain the clinical observation. In conclusion, sandwich transplantation with the elastin-collagen matrix can be used in a variety of clinical situations to support defect closures and pain relief in a simple, reliable and fast way with excellent safety. 1. Simpson DG. Dermal templates and the wound-healing paradigm: The promise of tissue regeneration. Expert Rev Med Devices 2006;3:471-84. 2. Hanpanich BS. Tissue engineering of skin and soft tissue augmentation, medical view. J Med Assoc Thai 2010;93 [Suppl 7]:S332-6. 3. De Vries HJ, Middlekoop E, Mekkes JR, Dutriex RP, Wildevuur CH, Westerhof H. Dermal regeneration in native non-cross-linked collagen sponges with different extracellular matrix molecules. Wound Repair Regen 1994;2:37-47. 4. Lamme EN, de Vries HJ, van Veen H, Gabbiani G, Westerhof W, Middlekoop E. Extracellular matrix characterization during healing of full-thickness wounds treated with a collagen/elastin dermal substitute shows improved skin regeneration in pigs. J Histochem Cytochem 1996;44:1311-22. 5. Koenen W, Felcht M, Vockenroth K, Sassmann G, Goerdt S, Faulhaber J. One-stage reconstruction of deep facial defects with a single layer dermal regeneration template. J Eur Acad Dermatol Venereol 2011;25:788-93. 6. Heckmann A, Radtke C, Rennekampff HO, Jokuszies A, Weyand B, Vogt PM. One-stage defect closure of deperiosted bone and exposed tendons with MatriDerm® and skin transplantation: Possibilities and limitations (German). Unfallchirurg 2011 [In press]. 7. Cervelli V, Brinci L, Spallone D, Tati E, Palla L, Lucarini L, De Angelis B. The use of MatriDerm® and skin-grafting in post-traumatic wounds. Int Wound J 2011;8:400-5. 8. Wang W, Zhang M, Lu W, Zhang X, Ma D, Rong X, et al. Cross-linked collagen-chondroitin sulfate-hyaluronic acid imitating extracellular matrix as scaffold for dermal tissue engineering. Tissue Eng Part C Methods 2010;16:269-79. 9. Lin YC, Tan FJ, Marra KG, Jan SS, Liu DC. Synthesis and characterization of collagen/hyaluronan/chitosan composite sponges for potential biomedical applications. Acta Biomater 2009;5:2591-600. 10. Van Zuijlen PP, van Trier AJ, Vloemanns JF, Groeneveldt F, Kreis W, Middelkoop E. Graft survival and effectiveness of dermal substitution in burns and reconstructive surgery in a one-stage grafting model. Plast Reconstr Surg 2000;106:615-23. 11. Van Zuijlen PP, Lamme EN, van Galen MJ, van Marle J, Kreis RW, Middelkoop E. Long-term results of a clinical trial on dermal substitution. A light microscopy and Fourier analysis based evaluation. Burns 2002;28:151-60. 12. Haslik W, Kamolz LP, Nathschläger G, Andel H, Meissl G, Frey M. First experiences with the collagen-elastin matrix Matriderm as a dermal substitute in severe burn injuries of the hand. Burns 2007;33:364-8. 13. Kolokythas P, Aust MC, Vogt PM, Paulsen F. Dermal subsitute with the collagen-elastin matrix Matriderm in burn injuries: A comprehensive review. Handchir Mikrochir Plast Chir 2008;40:367-71. 14. Ryssel H, Gazyakan E, Germann G, Ohlbauer M. The use of MatriDerm in early excision and simultaneous autologous skin grafting in burns--a pilot study. Burns 2008;34:93-7. 15. Ryssel H, Germann G, Kloeters O, Gazyakan E, Radu CA. Dermal substitution with Matriderm(® ) in burns on the dorsum of the hand. Burns 2010;36:1248-53. 16. Wollina U, Bayyoud Y. Reconstruction of a large scalp defect by the sequential use of dermal substitute, self-filling osmotic tissue expander and rotational flap. J Cutan Aesthet Surg 2010;3:106-10. 17. Haslik W, Kamolz LP, Manna F, Hladik M, Rath T, Frey M. Management of full-thickness skin defects in the hand and wrist region: First long-term experiences with the dermal matrix Matriderm. J Plast Reconstr Aesthet Surg 2010;63:360-4. 18. Wetzig T, Gebhardt C, Simon JC. New indications for artificial collagen-elastin matrices? Covering exposed tendons. Dermatology 2009;219:272-3. 19. Wollina U, Bayyoud Y, Kittner T, Dürig E. Giant tricholemmeal squamous cell carcinoma with cranial infiltration. J Clin Aesthet Dermatol 2011;4:34-7. 20. Wollina U, Meseg A, Weber A. Use of a collagen-elastin matrix for hard to treat soft tissue defects. Int Wound J 2011;8:291-6. 21. Atlan M, Naouri M, Lorette G, Estève E, Zakine G. Original treatment of constitutional painful callosities by surgical excision, collagen/elastin matrix (MatriDerm(® )) and split thickness skin graft secured by negative wound therapy. Ann Chir Plast Esthet 2011;56:163-9. 22. Greenwood JE, Mackie IP. Neck contracture release with matriderm collagen/elastin dermal matrix. Eplasty 2011;11:e16. 23. Riml S, Wallner H, Larcher L, Amann U, Kompatscher P. Aesthetic improvements of skin grafts in nasal tip reconstruction. Aesthetic Plast Surg 2011;35:475-9. 24. Körber A, Franckson T, Grabbe S, Dissemond J. Vacuum assisted closure device improves the take of mesh grafts in chronic leg ulcer patients. Dermatology 2008;216:250-6. 25. Price PE, Fagervik-Morton H, Mudge EJ, Beele H, Ruiz JC, Nystrøm TH, et al. 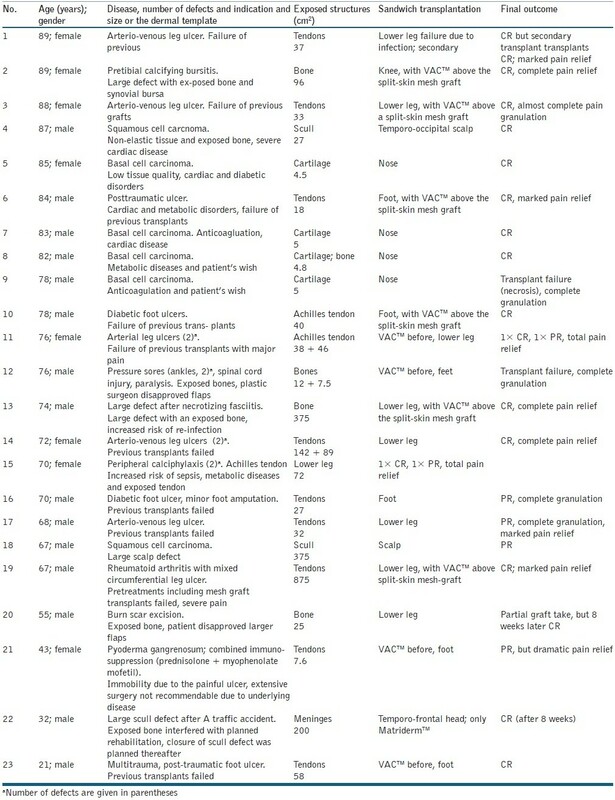 Dressing-related pain in patients with chronic wounds: An international patient perspective. Int Wound J 2008;5:159-71.